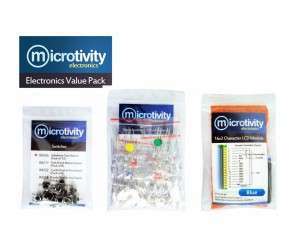 Quality electronics pack from microtivity. Great savings. Please refer to description for details. Save more when you buy this microtivity Electronics Value Pack! A pack of 60 assorted clear LEDs. Contains 10 Clear Reds, 10 Clear Yellows, 10 Clear Greens, 10 Clear Blues, 10 Clear Whites and 10 Clear Pinks. Comes with 60 200 ohm, 1/4-watt resistors for making connections. Forward Voltages are Clear Red and Clear Yellow 1.9-2.0V, Clear Green: 2.9-3.1V, Clear Blue, Clear White and Clear Pink: 3.0-3.2V. Packaged in a resealable zip lock bag for your ease of use. White on Blue with backlight. This 16x2 LCD module is based on the commonly-used HD44780 controller. It is easy to connect and program. A 16-pin header, a diode and a variable resistor is provided to help you make connections. A dozen 6x6x6mm micro tact switches. 4 pins for easy insertion into breadboard.